At We Smile Dentistry, we believe a lifetime of health begins in early childhood. That doesn’t mean you can’t change your habits later on, of course, but we all know habits are best formed at an early age. That’s why we love seeing kids in our office. Most of us have children and families of our own, so we know how important your kids are to you, and we promise to take the very best care of them as we would for our own. Healthy baby teeth help set the stage for healthy adult teeth to grow in properly later. Quality pediatric dentistry helps baby teeth grow up right. Early childhood education is essential for forming good values and healthy habits that will last a lifetime. We’ll teach them how to brush and floss properly, and why it’s important to do so. 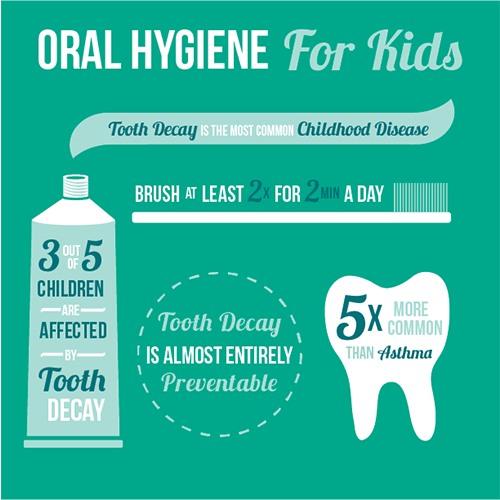 We’ll also teach them why it’s important to visit their dentist regularly for cleanings and checkups. At We Smile Dentistry, we place a strong emphasis on the mouth-body connection (oral-systemic link). We teach how the mouth is the gateway to the body, and how keeping your mouth healthy can keep your whole body healthy. We also teach kids the importance of nutrition to keep their body strong and their smile healthy. At We Smile Dentistry, the last thing we want is for your child to have a traumatic experience at the dentist. We want them to have a positive experience so they will want to come back. Dr. Spagnuolo and our entire team are nice and friendly and will make even the most anxious kids feel comfortable in our care. We try to make things fun and rewarding for kids by asking them about school, cracking jokes, and providing positive feedback for good checkups. At their regular checkups, Dr. Spagnuolo will perform a comprehensive exam, checking for things like tooth decay and gingivitis. Our hygiene team has a gentle touch to provide pain-free teeth cleanings for your family’s most delicate smiles. Whatever your little ones’ oral health needs are, we would be happy to take care of them at We Smile Dentistry. Gentle teeth cleanings remove plaque and tartar buildup. Fun flavored fluoride treatments help strengthen enamel and prevent cavities. If we find a cavity, we can stop tooth decay and repair the damage with tooth coloured fillings. If they need extra help, sealants add an extra layer of protection to keep tooth decay at bay. Schedule an appointment for the whole family today! If you have any questions about pediatric dentistry or would like to schedule a visit, please give us a call at (519) 661-0042 or get in touch with us online. Your London children’s dentist, Dr. Giulio Spagnuolo and our team at We Smile Dentistry look forward to smiling with you! Serving smiles from London, St. Thomas, Lucan, Dorchester, Strathroy, and beyond!